March 19, 2013 • Page 7 shop online at www.missourivalleyshopper.com 1650 Houses For Sale 1650 Houses For Sale 1650 Houses For Sale Houses For Sale Two High Quality Homes Applewood Area Lake Homes by Jim Tramp 113 Calumet Circle 6-bedroom, 4-bath, walkout basement. bright and open floor plan. 120 Quarry Pines Cabin style, 4-bedrooms, 25 foot high great room, extra large garage. Now building lake home on Nebraska side. For information, Call (605)661-2192. 1650 404 Belmont 6-bedrooms, 4-baths, lots of extras. New Townhomes 631 Sawgrass OPEN HOUSE Saturday, 3/23, 1pm-4pm on Fox Run Golf Course. 605-760-4712 • View 204 Brown St., Gayville 4-Bedroom, 2-full bath, 1881 sqare feet, 2+ car garage. ( 6 0 5 ) 6 6 0 - 7 5 3 7 www.yankton.net/204brown/ 2804 Preakness 5-bedrooms, 4-baths, fancy Call Kirby (605)660-1422 Read & Recycle! www.yanktontownhomes.com Call Classi?eds 665-5884 FARM for SALE Northern Cedar County with part of Chalk Rock Lake on property and surface water pumping permit for irrigation from Antelope Creek. Call for more information: Pfeil & Associates, Inc. Your Power Units worked hard last year! 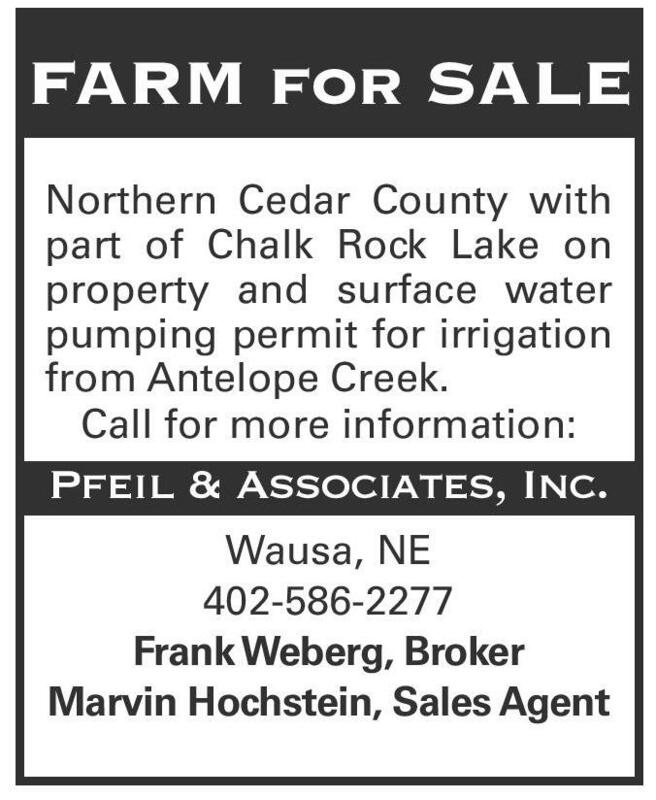 Wausa, NE 402-586-2277 Frank Weberg, Broker Marvin Hochstein, Sales Agent Be ready this season with inspections of your irrigation engines. We’ll Check: Keep your investment ready to work for you!! 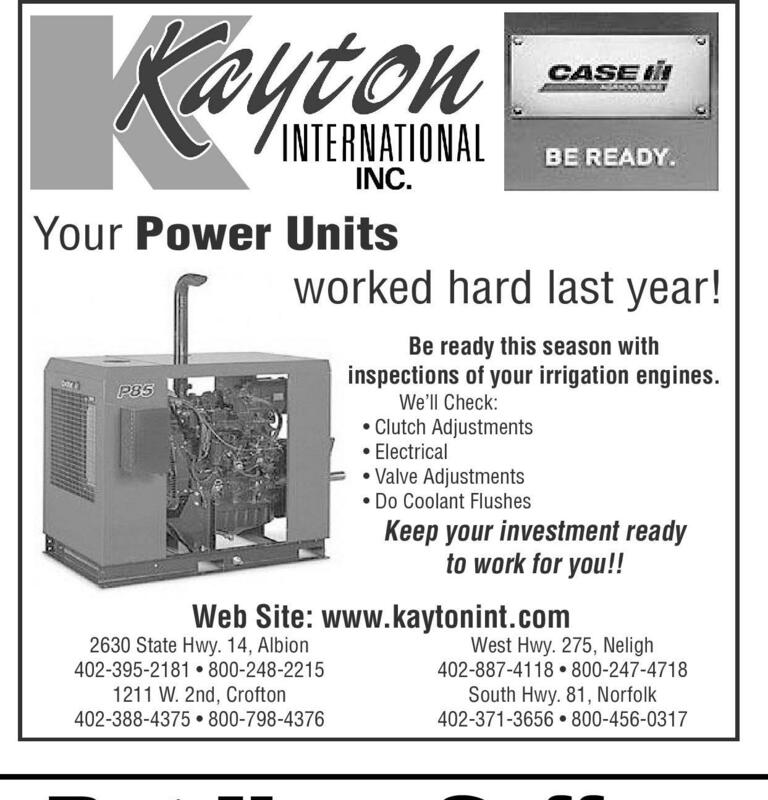 Web Site: www.kaytonint.com 2630 State Hwy. 14, Albion West Hwy. 275, Neligh 1211 W. 2nd, Crofton South Hwy. 81, Norfolk Put Your Coffee Cup Right Here! Wondering where to buy or sell a horse? In the classifieds, of course! There is only one place where you can find a show horse, a work horse or a race horse – CLASSIFIED! NOW TRY TURNING THE PAGE. Don’t you wish your advertising could stop consumers that effectively? Let’s face it, most of the time it gets lost in the shuffle. It takes a certain ingenuity to stand out in a crowd. You’ve got to be provocative. Unpredictable. A little smarter than the next guy - and you’ve got to have a real feel for the medium you’re working in. We put those talents to work for advertisers every week - and at no extra cost. It works for them. And you’ll have to admit, it just worked for you! SHOPPER 319 Walnut, Yankton SD 605-665-5884 216 W. 4th St. • Yankton, SD • 605-665-5884 • Fax 605-665-5882 Fax: 605-665-0288 MISSOURI VALLEY There is only one place where you can sell your old gray mare, a black stallion or a horse of a different color – CLASSIFIED!